This article was published in the Nov. 10, 2017, issue of the Daily News-Record. 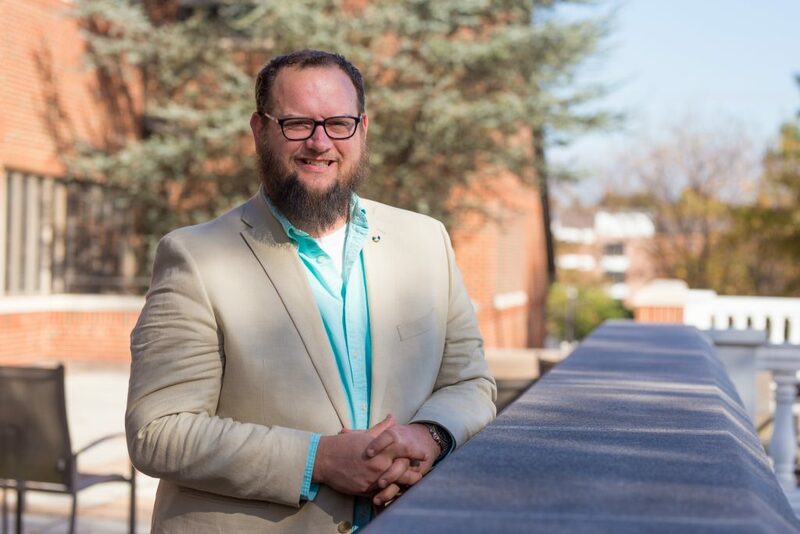 Steve Giddens earned a Master of Divinity degree at Eastern Mennonite Seminary and will complete a counseling degree at Eastern Mennonite University in two years. Read more about veterans at Eastern Mennonite Seminary. 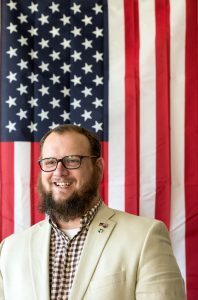 When Steve Giddens returned from serving in Afghanistan, his church told him he was no longer welcome. Giddens, 34, who served three tours in Iraq, Afghanistan and Kuwait, was told he “perpetuated evil and violence,” he said. A decade later, Giddens now serves as a pastor at St. Stephen’s United Church of Christ on South Main Street. People ask him how the church can accept military and law enforcement personnel, he said, when the Bible says people are not supposed to kill. He never saw himself working as a pastor. Giddens enlisted in the Army in January 2001 at age 17, having grown up in St. Cloud, Fla. He served for six years before transferring to the National Guard, where he served another six years. On Christmas Eve 2002, he was deployed to the Middle East to assist with the March 2003 invasion of Iraq. He served there until July 23, 2003, as a private. He drove a truck for a small, mounted infantry unit that was transporting artillery pieces into the country. His job was to maintain the truck to ensure it kept running and memorize maps and charts of the route ahead. There was a unit ahead of the artillery pieces that saw most of the fighting, he said. But the gunman on his truck did have to fire a handful of times. After the tour, he returned to Hunter Army Airfield in Savannah, Ga., to work on the logistics behind getting equipment to soldiers in Iraq and Afghanistan. He also helped receive the bodies of dead soldiers returning from the Middle East. In April 2004, he was sent to Afghanistan to a base near Kabul. Sometimes, he was transferred to other bases depending on their needs, but he remained in Afghanistan until July 2006. He served as a mortar man to defend the base, helping position cannons to launch projectiles over buildings and hills. Essentially, they were the last line of defense in case of an attack, he said. He also helped patrol the town, looking for suspicious activity, and walk roads searching for explosives that could threaten a military truck. Giddens and his fellow soldiers were shot at in town, he said, forcing them to decide in each situation whether to engage the enemy or call in the incident. Overall, he enjoyed working in Afghanistan, he said. On the base, they worked with nine or so different countries, including Poland, France and Germany. The French decided to build a windmill for a well, so American soldiers protected the French engineers while they worked. They also guarded medics who went into the town to vaccinate children. At one point, a school was destroyed, so some of the community members asked the soldiers to help them build a new one, he said. When he returned to the states, everything had changed. He struggled for two or three years transitioning back to normal life. He lived off his savings for awhile, sleeping in his truck or on people’s couches. Eventually, he decided to return to work, taking a job working security for a casino in Tampa. He moved on to manage the housekeepers in the casino, where he met his wife Amanda, who worked at the front desk. He transferred to the National Guard, spending one weekend a month training. On Jan. 1, 2010, he was deployed to Kuwait. There, he worked in an office and was responsible for tracking all 250 personnel and their equipment, including artillery pieces, weapons, bullets and spare parts in his company. He kept track of all the company’s physical fitness, education and training data. Though he did not plan the troops’ movement, he helped facilitate their missions. The intelligence people gave him threat assessments for areas, which he published for those conducting the missions. He tracked the trucks, and had to call in incidences when they hit explosives on the road. He left Kuwait on Dec. 21, 2010, and returned to Florida. He later quit his housekeeping job, and he and his wife moved to Vermont, where he attended and graduated from Sterling College in Craftsbury Common, Vt., in 2014 with a bachelor’s in therapeutic applications of outdoor education. He later moved to Virginia to pursue a master’s degree in seminary and counseling at Eastern Mennonite University, where he is still enrolled. He wrapped up his seminary studies and will complete his counseling degree in two years. He began attending St. Stephen’s, and when the congregation’s pastor left, they asked Giddens to serve, a role he began in June 2016. But he’s not quite through with the military and intends to help those he served alongside. Down the line, he wants to become an Army chaplain, helping serve troops in a spiritual role but also as a mental health resource and advocate for their needs. This article was published in the Nov. 10, 2017, issue of the Daily News-Record. I embrace your story. But when will you talk about the misguided policy decisions that send troops into the wrong battles–Korea, Viet Nam, Afghanistan, Iraq? Read Andrew Bacevich, Washington Rules and America’s War for the Greater Middle East, and Robert McNamara, In Retrospect: The Tragedy and Lessons of Viet Nam.